Project Goal: The Long-Wattled Umbrellabird is extremely threatened, and its habitat is equally threatened. Advance scientific understanding about the bird, and work with local communities on more sustainable practices that will reduce logging and maintain the forest. The Long-Wattled Umbrellabird gains its name from the rather bizarre and striking features of the male of the species. 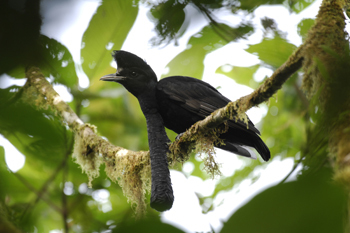 The long-wattled umbrellabird is endemic to western Ecuador’s Choco Forest, a highly endangered habitat. Illegal logging, hunting and colonization threaten the species and it’s habitat. Finding Species in collaboration with The Center for Tropical Research, a conservation and research organization, from UCLA, provided effective conservation action for the forests of north-western Ecuador. The partnership’s work included research into the biology of the long-wattled umbrellabird and surveys of its population, which helped to develop conservation strategies for this unusual species. Finding Species in collaboration with The Center for Tropical Research, a conservation and research organization, from UCLA, is currently working to provide effective conservation action for the forests of north-western Ecuador. The partnership’s work includes research into the biology of the long-wattled umbrellabird and surveys of its population, which will help towards developing conservation strategies for this unusual species.